Hey there! Thanks for dropping by cameras and carry-ons! Take a look around and grab the RSS feed to stay updated. See you around! 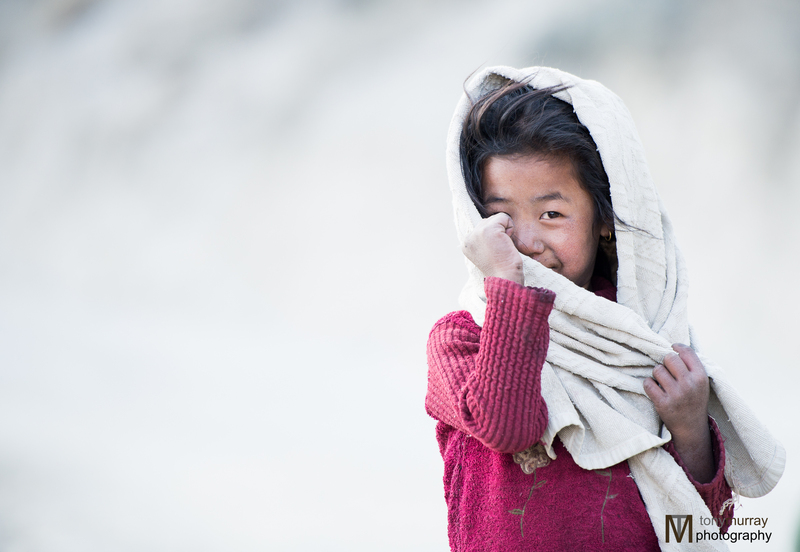 Our favorite city in Nepal, although we only spent a short time there, was the town of Marpha. 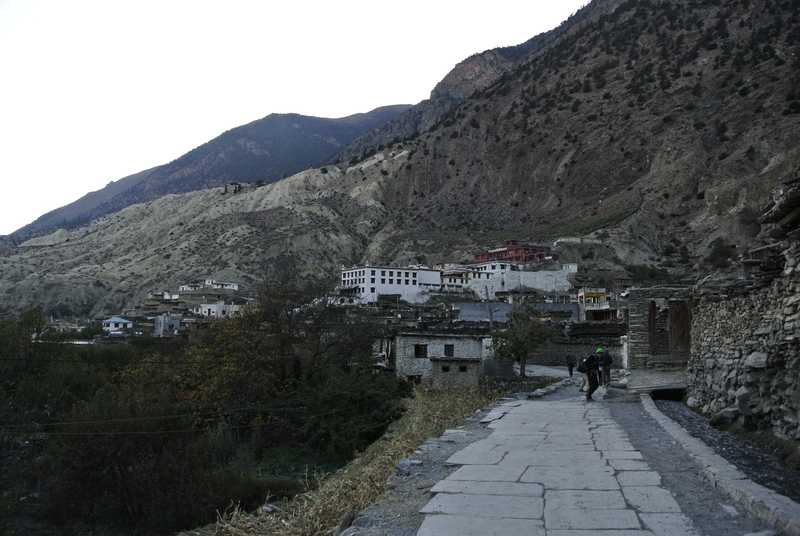 Marpha is an amazing town, it is built with rocks and set up on the hill side. No cars can drive in the town because the walkways are too narrow. It is a smaller rural town that has many apple orchards and specializes in apple products.I do not even like apple juice, but the apple cider I drank in Marpha was incredibly delicious! 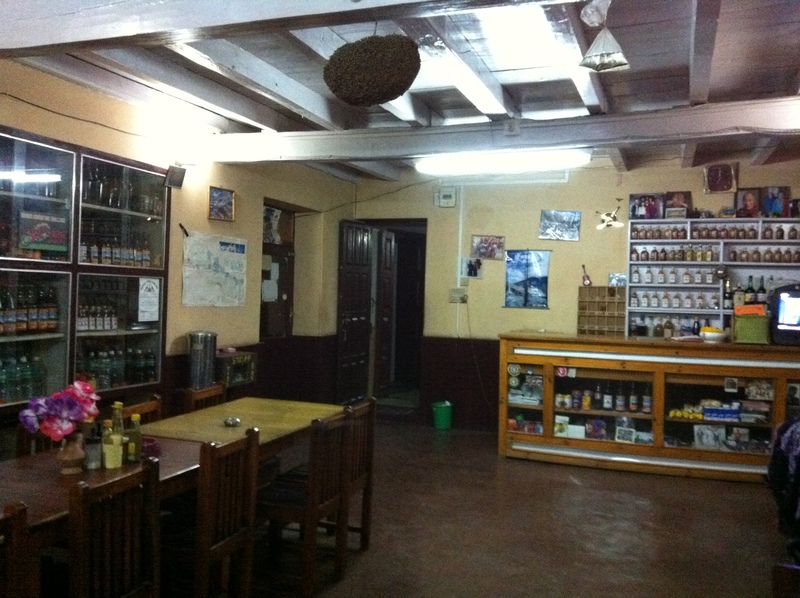 We arrived late at night and luckily our driver knew some friends who run a hotel/guesthouse in the town. The man who owns the rooms walked the mile down to the road to lead us back to his place, which we never would have found in the dark! He was even gracious enough of a host to start the fire back up in his stove and make us a late night, utterly delicious, spaghetti dinner. 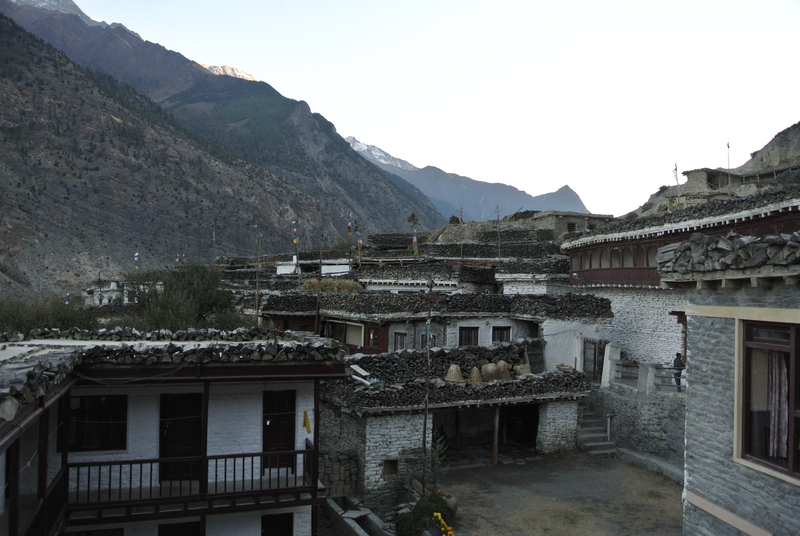 Marpha- our room was the one in bottom left corner- this is the view from the courtyard. Our rooms in the hotel were much better than we anticipated. They had two small twin mattresses/pads set up on a raised box platform with on-suite bathrooms. There was even “hot” water. Hot being a loose term, but when the air temperature gets down to 20 degrees at night, a little better than luke warm feels just fine. After we slept (cuddled in our sleeping bags cause it was cold!) we woke up to a beautiful Himalayan day. 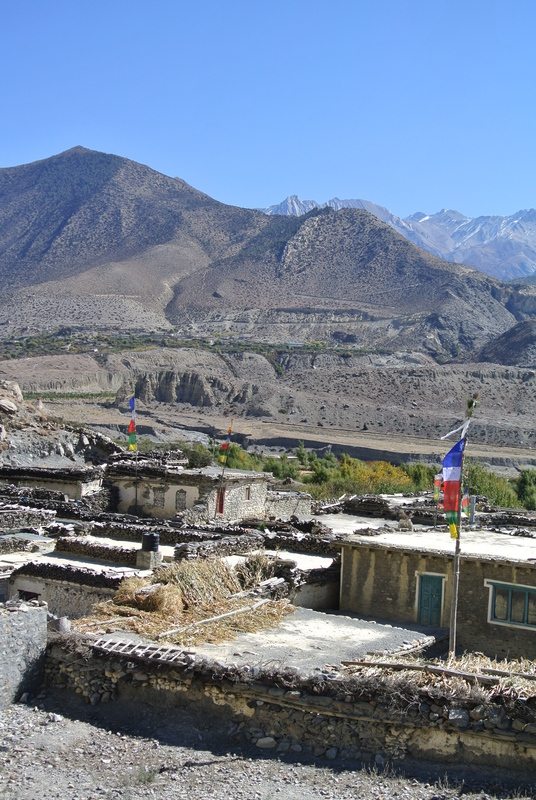 We were told that the hike up to Jomsom (the town with the airport), was only about an hour hike. Maybe this was a fair estimate for really awesomely intense Neplai hikers, but it took us nearly 3 hours. Granted, we did stop a lot, as usual, to take many photos and it ended up being a fairly warm day. The hike was fun, maybe a bit dusty if cars drove by, but the mountains were stunning so we really could not complain. 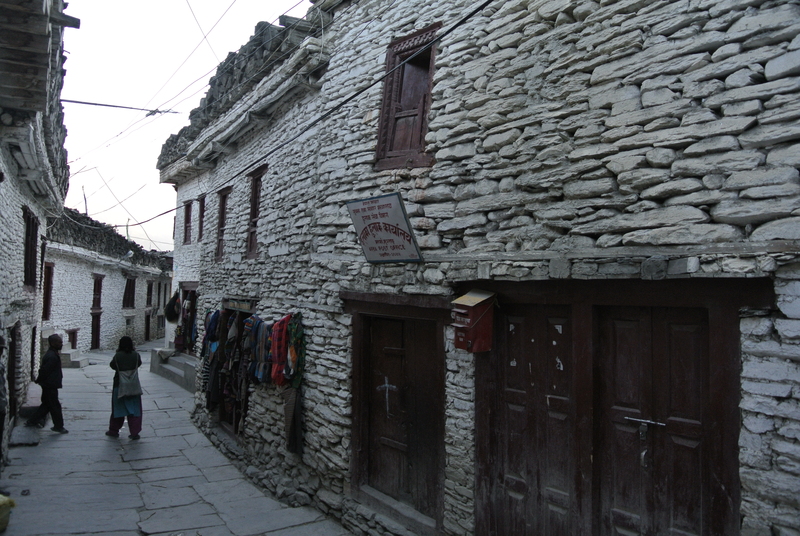 Once in Jomsom we talked to the airline people to try and get tickets and then we grabbed lunch at a small hotel or guesthouse. It was a nice relaxing day, but we decided not to hike back, so we took a local bus instead. The bus was insanely crowded, very dusty, and quite uncomfortable. This is when I knew that Tony and I would be finding Dhan again the next day if we could not get a flight (No way was I spending over 10 hours on the slower, more unsafe, way more uncomfortable bus to get back to Pokhara). 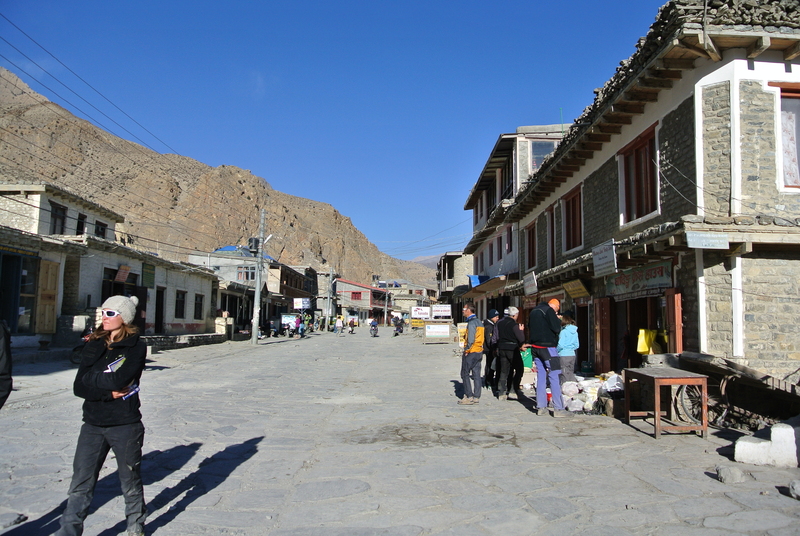 Jomsom- the main road through town. Tony decided to hike back to try and get some sunset pictures with the mountains. I was worried when it took him so long, but he was stopped on the way back by a little group of kids that just loved getting their photos taken. Tony said that the kids thought it was the coolest thing to get their picture taken and then be able to look at it on the LCD screen. While Tony was gone I of course did some shopping. I was able to talk to this woman who lived in Marpha and handmade jewelry to sell. I watched her work on a piece and it was pretty incredible. The jewelry was made out of bone and horns from mountain goats. She would shave and cut the horn into beads and then hand paint each one. It was really nice to buy something 100% authentic and not “made in China”. Well it is pretty obvious that blogging consistently is not my calling. Sorry- I have no excuses and no more promises. Tony and I have been on four more vacations since Nepal and now I am VERY behind. Unfortunately I am one of those people who must go in order. I cannot simply just stop where I am at in Nepal and pick up with say our Paris trip from last month. So- I am determined to blog more frequently, but- no promises J. I will be enlisting Tony to help me catch up, so now you will get to hear from both of us. 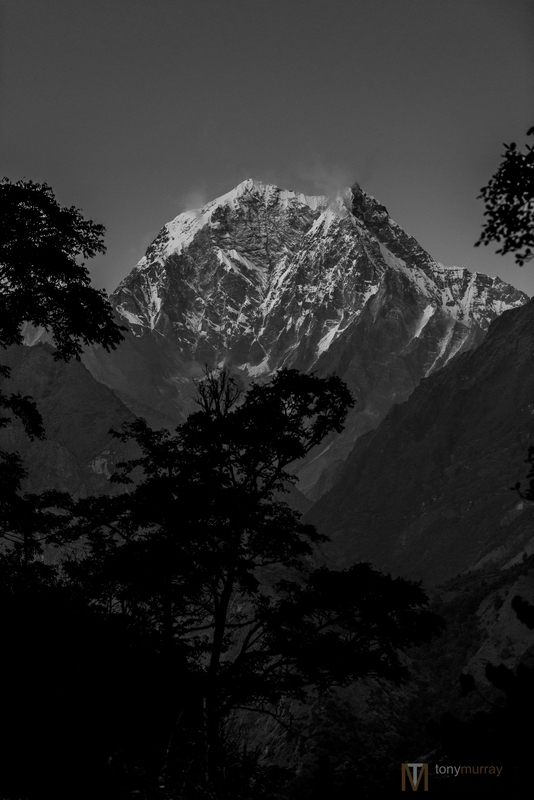 So- let’s start where I left off: Travel in Nepal. 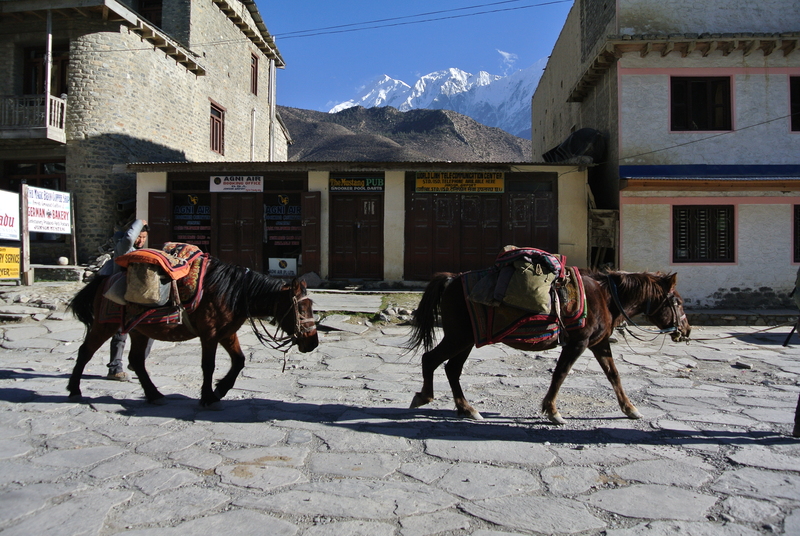 We were fortunate enough to use every mode of transportation available in the small country of Nepal. Jeeps, taxis, airplanes, buses, motorcycles, canoes, and our own two feet! I guess this is not every transport available because we never did ride a horse, but I would say we did pretty well. In Nepal you are not allowed to rent your own vehicle, so from Kathmandu to Pokhara we hired a jeep to take us the 6 hours through beautiful country. 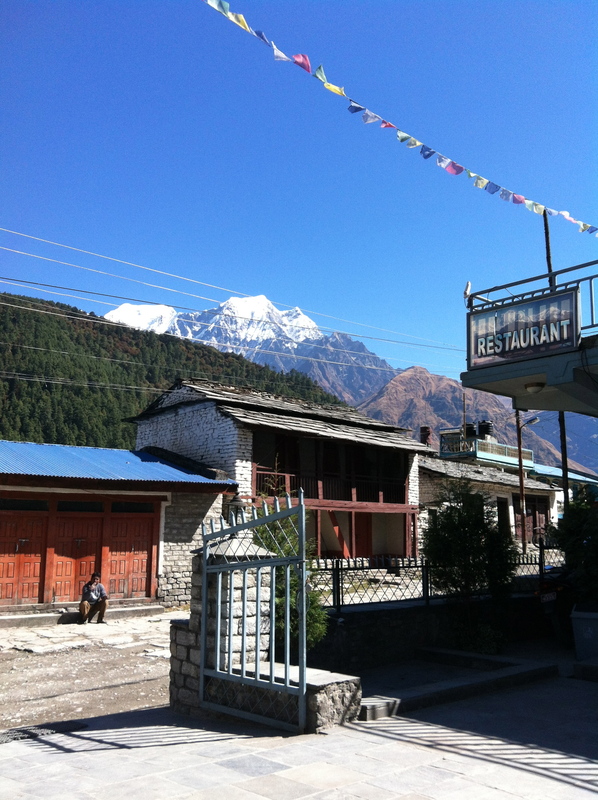 It was fun to see the different Nepali towns as we drove. Sweet bridge we found while driving- it was fun to check it out! The roads we took were paved, but much skinnier than we were used to. Luckily we only got in one accident, which was not our fault. It actually shouldn’t even count as a real accident because we barely hit the car in front of us because there was a scooter in the road just stopped and the car in front of us could not stop quickly enough. There was a lot of yelling involved between the two cars and scooter drivers and after about 2 minutes every local person in the area walked over to see what was going on. We all got a lot of interesting looks and I guess I felt a little bit like a zoo animal on display. All went well and we were off in only about 15 minutes. I have no idea what was decided in the end, but everyone drove off- so I assume it all worked out okay. In Pokhara we used several taxis, many of which I was worried wouldn’t quite make it up the hills and of course our canoes on the lake. 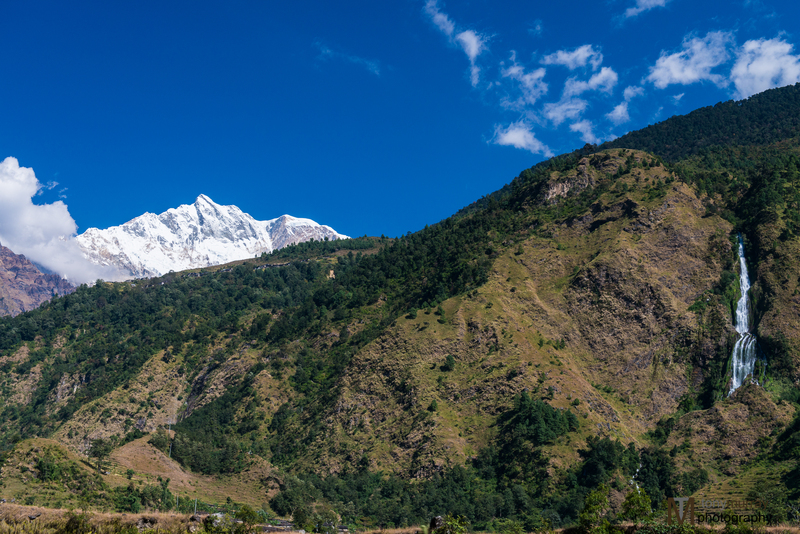 In our original travel plans we had booked a small plane to take us from Pokhara to Jomsom, a high elevation town in the Anapurna range. We arrived to the airport early and were told that our flight was delayed. The word “delayed” is never good when talking about small planes flying into big mountains. The super early flight had not left yet and we were told that due to the very high winds in Jomsom they could not risk landing any plane up there. Of course, they figured the wind would die down and we could just wait a few hours and still be able to fly out. As with most airline delays, this was of course not the case. We ended up spending almost 6 hours at the airport before they cancelled all Jomsom flights for the day and refunded our money. Unfortunately all flights for the next day were booked and we would not be able to fly out for another 2 days. This is the time when I advise you to always have a back-up plan. 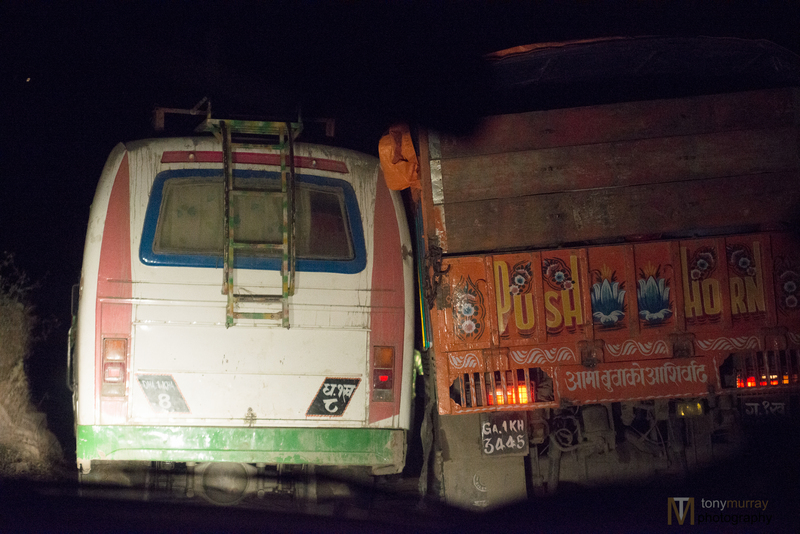 If you ever travel to Nepal- do one of two things 1: have a back-up plan in case your travel arrangements do not work out. Research something else you can do in the area that you may enjoy just as much as your original idea. 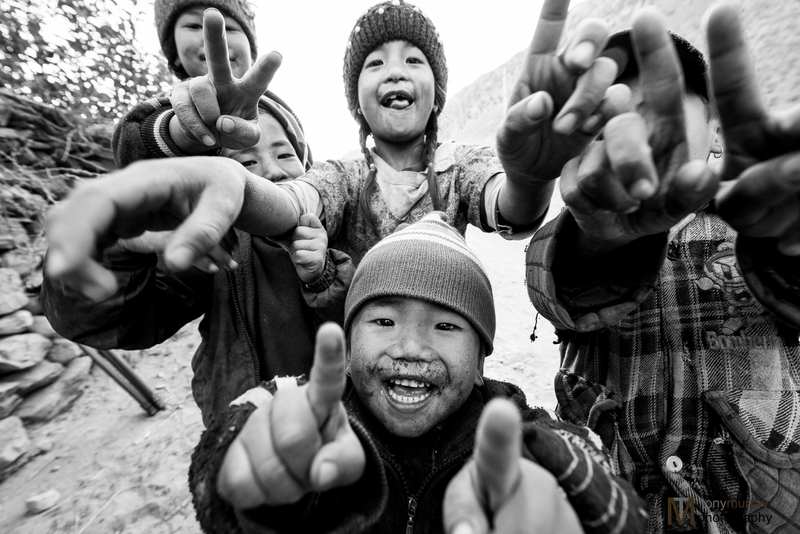 –or- 2: Go to Nepal with several more days than you think you need. If you plan on doing a trek and you think you need 10 days, just plan 13-15 days. This way you can stick to your original plan and enjoy your vacation to the fullest, even if your travel plans are changed. We did not have a back-up plan and we did not have extra days. After we left the airport we were tired and desperately needed lunch. We wandered around a bit and talked in circles about what we should do. 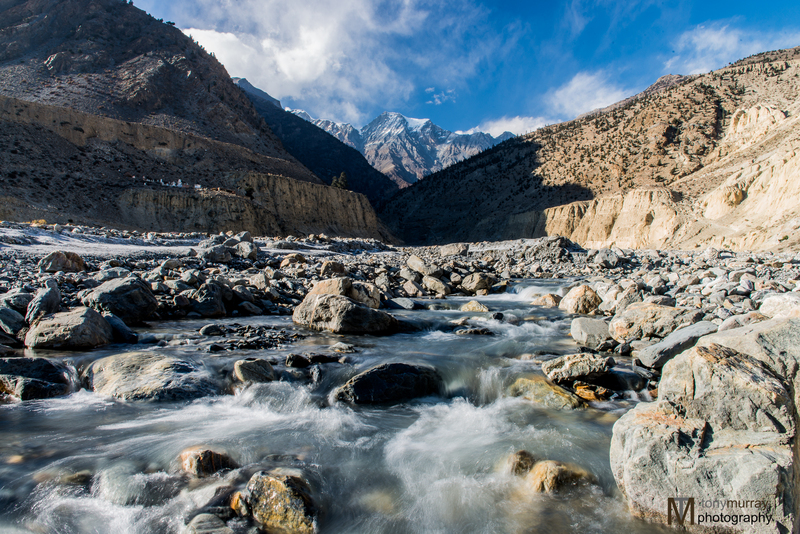 Finally, after much debate, we decided to try and make our way up to Jomsom by car or bus. I think we had our hearts set on getting up to the small mountain towns even though it wasn’t entirely practical for us to do so at this point. We were able to hire another jeep to take us up the mountain; unfortunately we had no idea what we were really getting ourselves into and it cost us much more than our plane ticket. Our driver Dhan was awesome! He was a safe driver and made very good time (all things considered). Let me start by describing the road. For about 90 minutes we had the “luck” to be on paved roads. Paved is a loose term; we still crossed many streams, pot-holes, and loose gravel sections. The trick is I had no idea that was the good part! 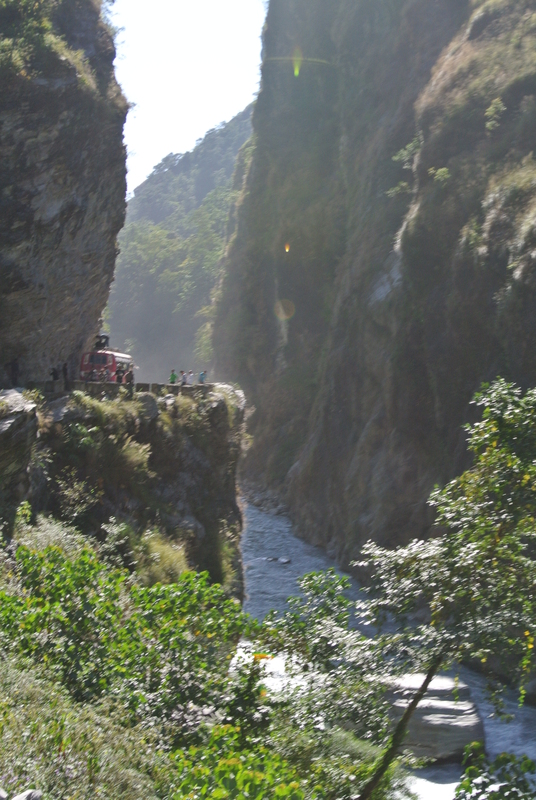 After this 90 minute journey through the Pokhara valley and beginning of the Annapurna range, we started on the “no black top” canyon road. We could not go over about 25mph the next five and a half hours. The road was, needless to say, terrible. Terrible and somewhat terrifying. The canyon road was quite skinny with lots of curves and always going up. There were always larger buses passing us going down and sometimes there just wasn’t enough room for both. 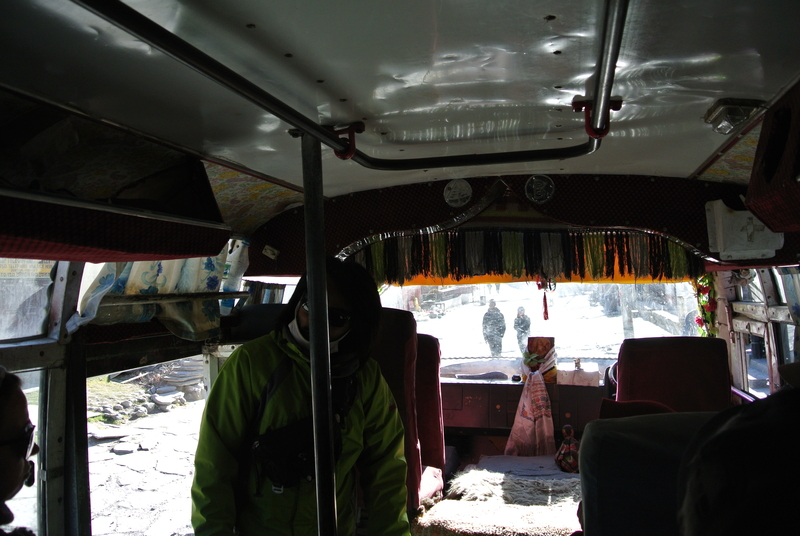 The best part of the trip came when we came upon a line of stopped jeeps and buses on one of the passes. Up ahead the next bend there was an SUV with a broken axle. Yup, a broken axle and he was taking up so much room no one could pass on either side. Good times. So- all the men in the buses, Tony and Jared, and other SUVs got out and basically lifted the broken car up and pushed it up farther onto the side of the mountain, so there was just enough room to get by. This worked well, but it was a little tricky getting all the cars past because there were so many of us stopped, not to mention it was pitch-black nighttime. (Unfortunately because it was so dark, we don’t have any pictures of this event that you can really see, but it was as close as the above photo- from earlier on our drive). 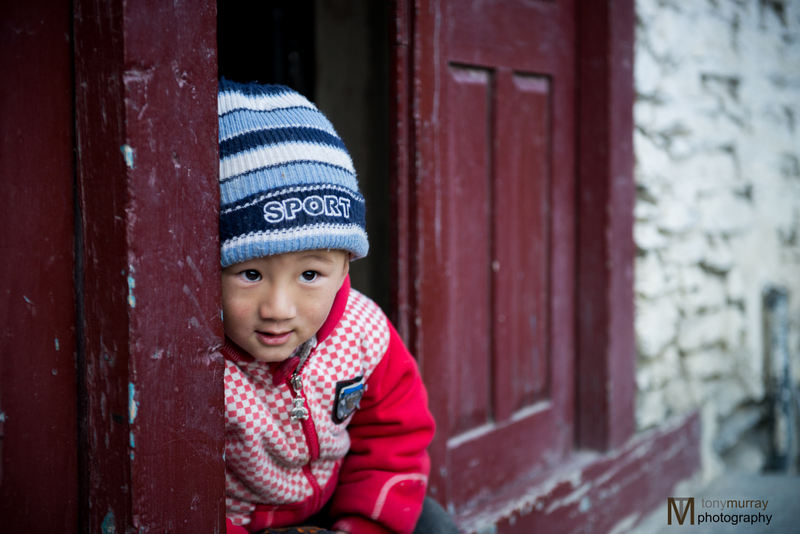 We finally made it to Marpha, a small town just south of Jomsom with headaches and sore backs, but we didn’t fall off the side of the mountain, so all in all it ended well. Yes- Passing this close happened several times on our drive. The next morning we hiked about 2 hours to Jomsom to try and book flight back to Pokhara for the next day. Unfortunately they only had two available spots, so we let our friends take the tickets and the next day we went to the airport to try and see if someone might miss their flight. We did not have another 3 hours to hike from Marpha back to Jomsom, so of course we just paid some boys in Marpha to give us a ride on their motorcycles. Riding on a motorcycle while wearing your overnight back during the sunrise was quite the awesome experience! It was a little scary on the dirt roads, but very exhilarating and in some ways even a little peaceful. Actually, and I think Tony would agree, it was one of our favorite experiences: Riding on a motorcycle during the peaceful sunrise in the Himalayan mountain, quite surreal. 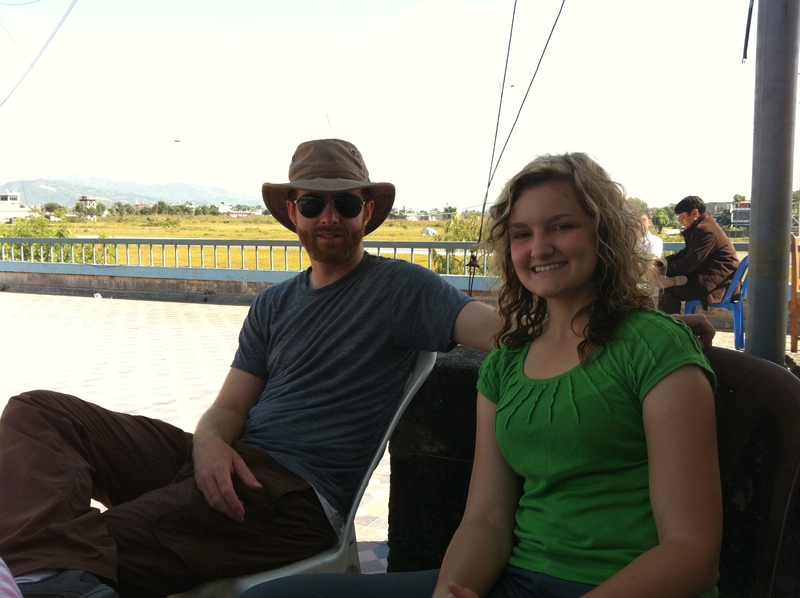 So another morning was spent in a tiny little airport and of course everyone showed up and Tony and I went to hire Dhan for our jeep ride back down. I think that driving in the day was a much better plan. It wasn’t nearly as scary when you could see and we were able to stop along the way and take a lot of pictures and eat lunch in a fun little town. On the way down we were able to get to know Dhan a little better. Two fun facts(aka FFs): 1- Dhan used to live and work in Doha as a security guard (he didn’t like it), small world huh?! 2- We asked Dhan “So- do buses ever fall off the cliff?” (thinking it would be reasonably rare) and he responded “Oh yeah (as if it weren’t that big of a deal), Like 20 a year.” WHAT?! Good thing we were on our way down and almost out of the canyon…. Also good thing we did not go cheap and ride the bus. In the end I would say we actually enjoyed the jeep ride back down because we were able to appreciate the scenery and enjoy the mountains we had come to spend time in. 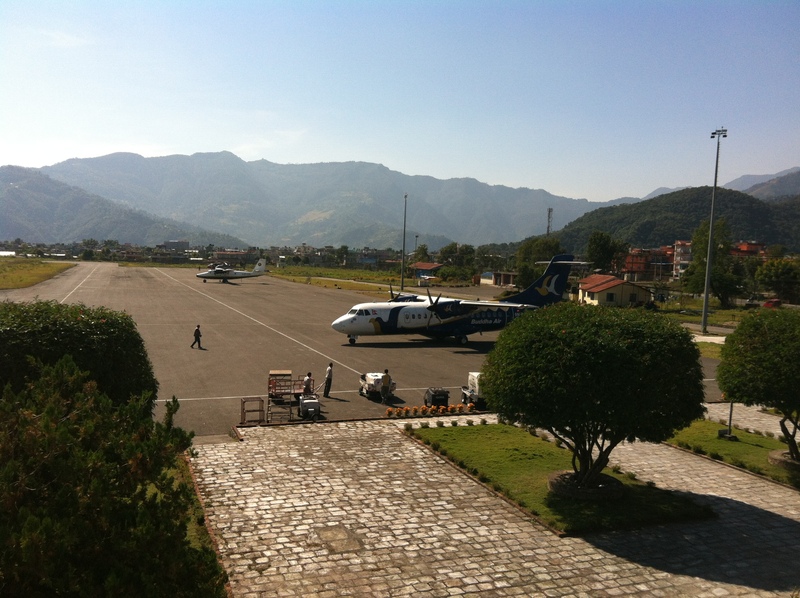 Luckily for us, we were able to fly out of Pokhara back to Kathmandu and we could say goodbye to long car travel for a while (at least until Sri Lanka in December). 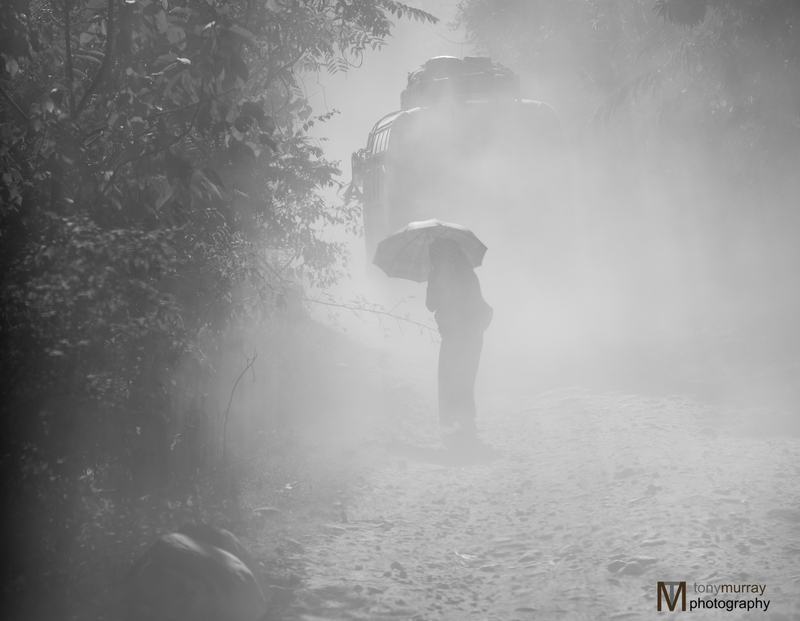 Here are some scenery photos from our day-time drive…..
Once we came upon two buses in a row— look at all the dust they left behind! 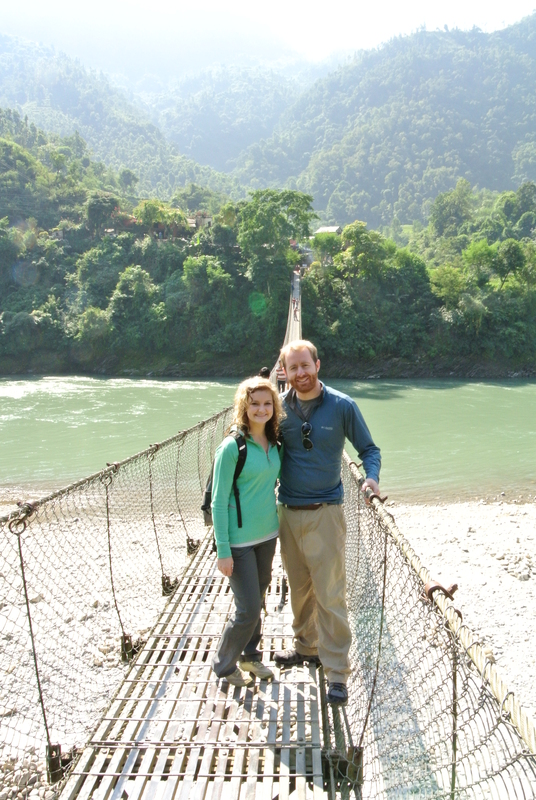 All in all our travel experience in Nepal was just part of the adventure. It was not like traveling or driving anywhere else in the world. I think that is part of the charm of the country. It is something to be patient and very flexible about, but also something to be enjoyed. It makes a fun story, and good memories. Sorry for the wait….. I will be more consistent, I promise! Pokhara, Nepal. This was a very fun little city and trekker trap. During our trip we were in Pokhara for 2 days and then an extra day and a half before flying back to Kathmandu, we ended up spending more time here than we originally planned due to some cancelled travel arrangements (stay tuned for that story in a few days). 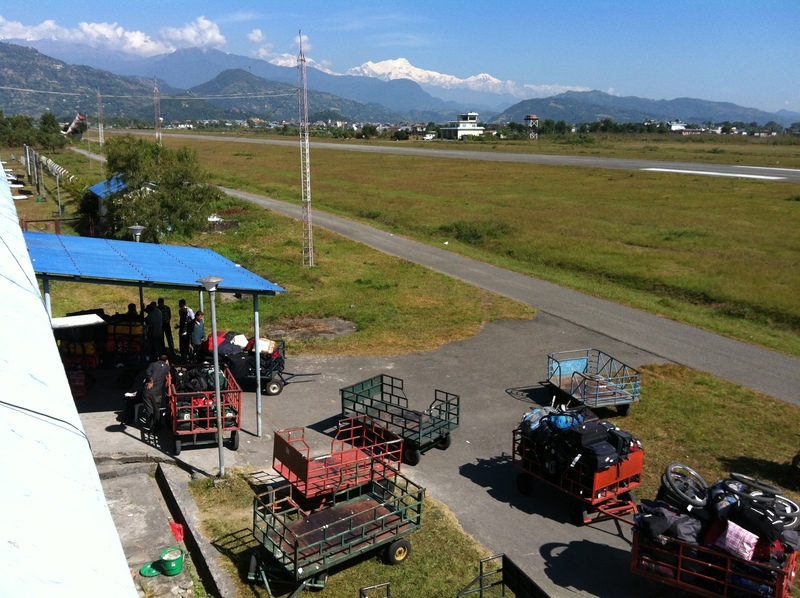 We arrived in Pokhara by jeep from Kathmandu. After a 6hour ride, we were ready to rest up. 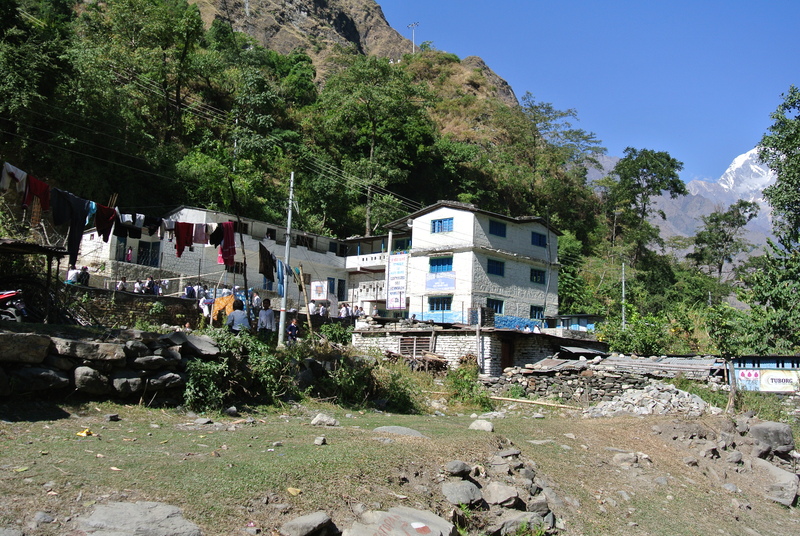 We were lucky to stay just off of the main road, Lakeside, in an awesome hotel, Sampada Inn. The beds here were much more comfortable than the ones in Kathmandu, and we had a fun view of the city and surrounding mountains. It didn’t hurt that the staff was kind and very helpful as well. 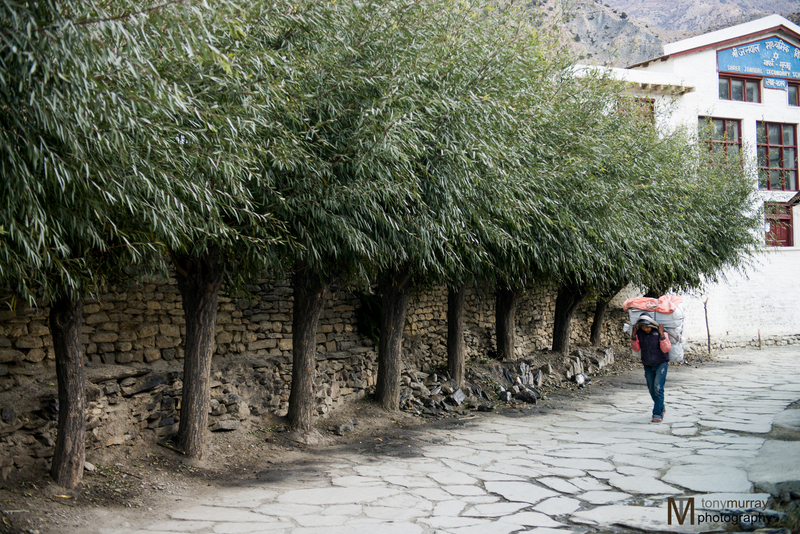 Lakeside is a fun street with shops, restaurants, and trekking offices everywhere! 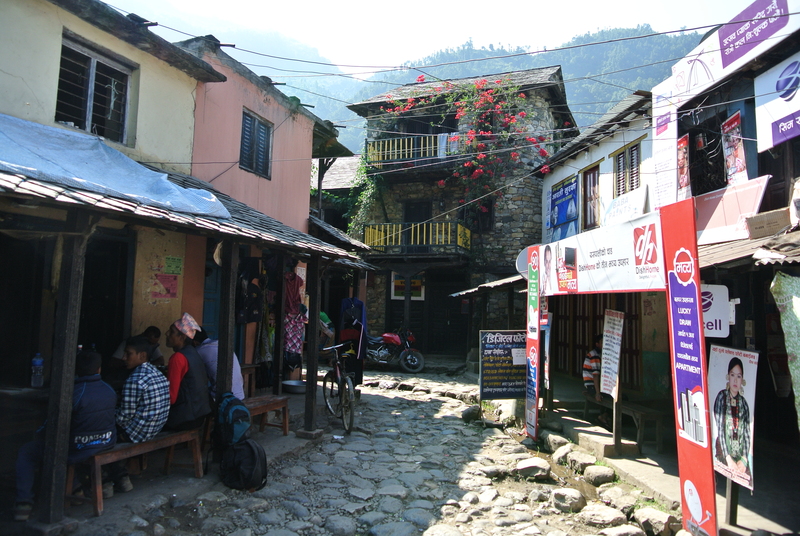 No matter which way you started walking you could easily find all types of food (in fact most restaurants served a very wide variety), lots of souvenirs and hand made Nepali crafts, and all the knock- off NorthFace trekking gear your heart could ever desire. We had so much fun wandering the street to shop and eat, it was very relaxing. True to its name, Lakeside is next to…… you guessed it….. a giant Lake! Beautiful mountains surround the lake and it wasn’t full of jet-skis or large boats pulling water skiers. One evening we decided to rent a canoe for several hours and we paddled our way across to the other bank to try and get a different angle to take pictures of the sunset. Where we could actually land our canoe our view of the mountains was blocked, so we ended up going out to the middle of the lake to get some photos and enjoy the evening light as it faded behind the mountains. Although the shore was crowded with people and shops along the shore, as well as several canoes in the water, it remained peaceful and somehow serene. Another enjoyable thing we did in Pokhara was the Sarangkot sunrise. 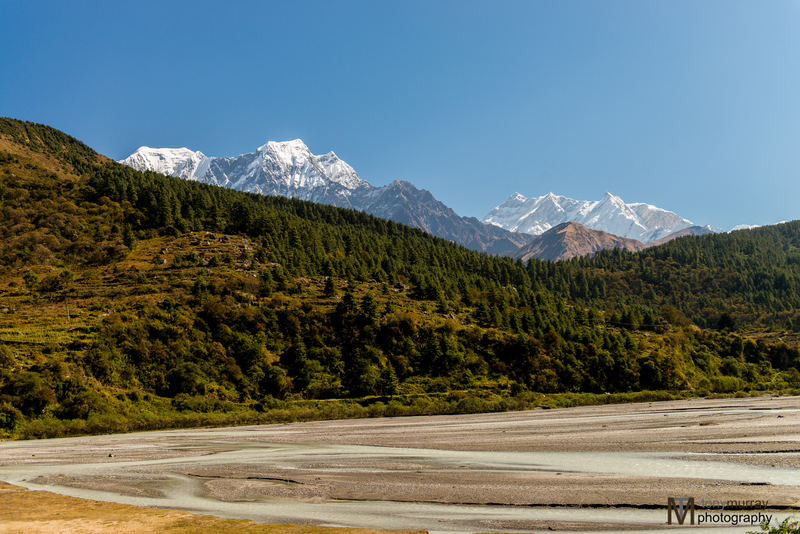 There is this small mountain that looks over the lake on one side and the breathtaking Himalayan range on the other. We hired a taxi to drive us up to the small town on Sarangkot. After he dropped us off we hiked for another 30 minutes or so to reach the top. On the way up you hike on this trail that goes past small Nepali houses and huts. It is so dark you can’t see very far and you wonder how many more “stairs” you will need to climb and how much further you really need to go. After hiking by flashlight for about 20min a gray light starts to cover everything and its just enough for you to see ahead of you, but not enough to see what is off the side of the mountain. Close to the very top there is a small Buddhist shrine and the only about 50 stairs left. At the top of the stairs there is this fantastically old arch, and the scene behind it was breathtaking. All this time hiking in the dark I had no idea the mountain were that “close”. It was incredible to have your view through this arch be fully encompassed with mountain, no sky, no ground, just huge giant mountains. 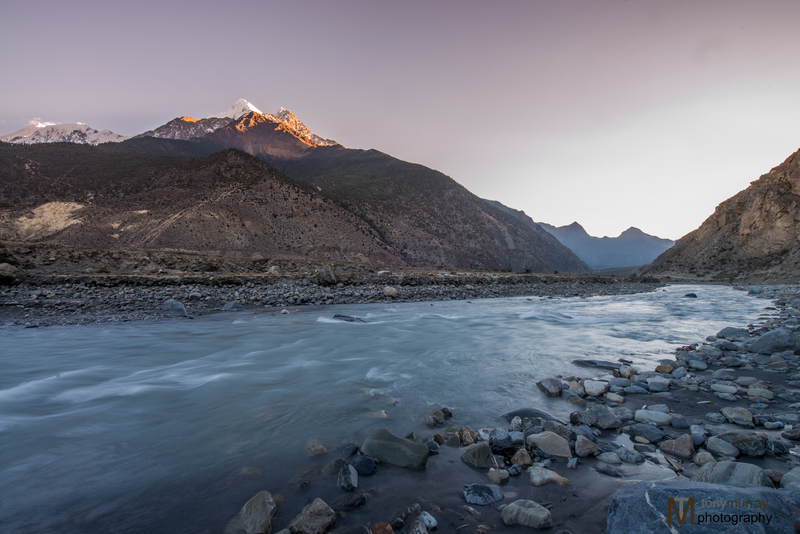 As you finish the hike and find a spot to sit on the viewing platform, just in time, the sun starts to peak up over the hills and light the Himalayas in an incredible way! It was beautiful and I am actually happy I woke up early to see it. On our extra day in Pokhara, before heading back to Kathmandu we actually did Sarangkot again for sunset. We didn’t go all the way to the top, but found a nice little field off behind this man’s house that he let us use. It was again, beautiful to sit and take in the scenery as the sun went down. Later that night we began our shopping. We didn’t want to buy anything on our first 2 days in the city, because we didn’t have much space to carry souvenirs in our overnight backpacks, and we did not want to have the extra weight for any hiking we might do. So—we crammed all shopping into the evening and next morning before our flight. It was fun to look for scarves, jewelry, art, etc. We were able to buy several fun/good quality things for not too much money…. Unlike the souvenirs in Mexico- that always feel cheap and half of them are made in China ;) It was nice to buy some things that were truly locally made by Nepali people. 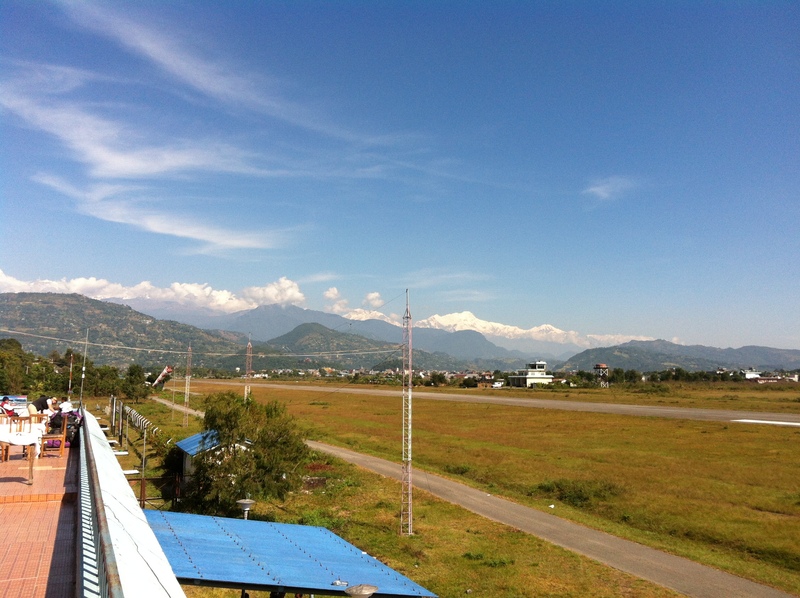 Overall, Pokhara is a fun town to shop and dine. Although we had more time here than anticipated (and maybe didn’t do as much hiking as we wanted) it was a good place to spend our time and we thoroughly enjoyed it! *I promise to blog again in 3 days! 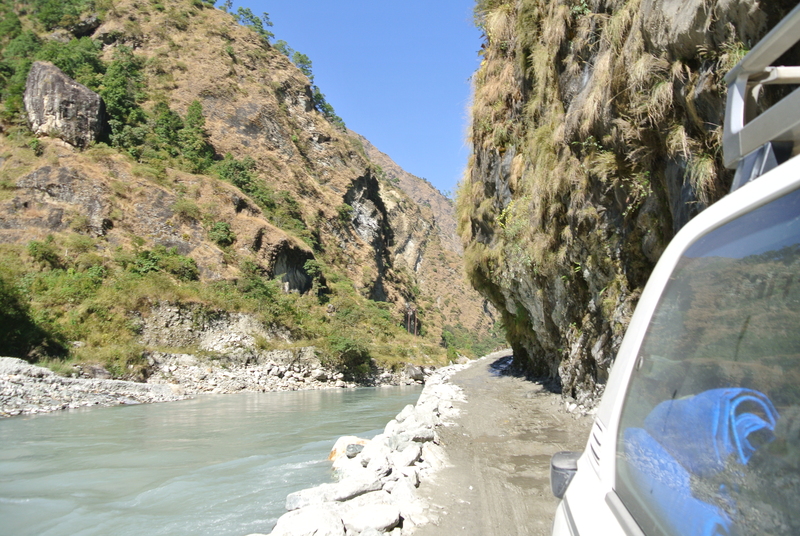 Up next Travel in Nepal- scary and harrowing jeep rides through unpaved canyon roads…..